Travel from the Orlando (MCO) airport to the Coronado Springs Resort and back at the end of your stay at no charge along with all your luggage. If you book your Magical Express at least two weeks prior to your arrival, Disney will send you luggages tags so that the Disney concierge can pick up your checked luggage directly from baggage claim and transport to your room for you and you can go directly to the Magical Express transport. Provided the names of all people in your party are on your room reservation, you can arrive at the airport and check in with Disney’s Magical Express for free transportation to your Disney resort along with your luggage even if you don’t book in advance. And the concierge at the airport will book you for your return Magical Express trip at that time as well. You can check your luggage and get your boarding pass with the concierge at the Disney resort at the time you are picked up for the Disney Magical Express back to the airport which means no waiting in line at the airport! 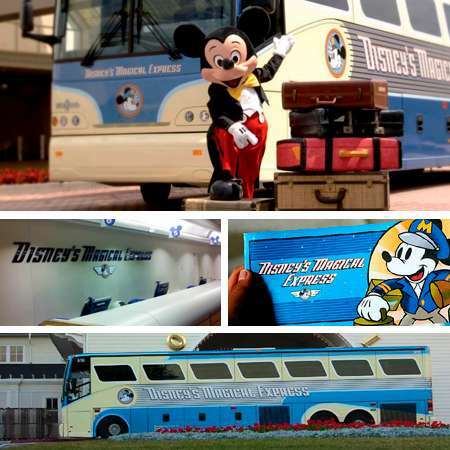 The Magical Express ride is air conditioned and comfortable with Disney entertainment on the ride.